It's Time To Share The Wealth! You are here: Home / Great Deals / It’s Time To Share The Wealth! It’s Time To Share The Wealth! Ok, so I have been waiting until towards the end of the week to talk with you about this. So, here we are, you have a few days to think about how you want to help. Saturday, May 8th is Stamp Out Hunger Day. 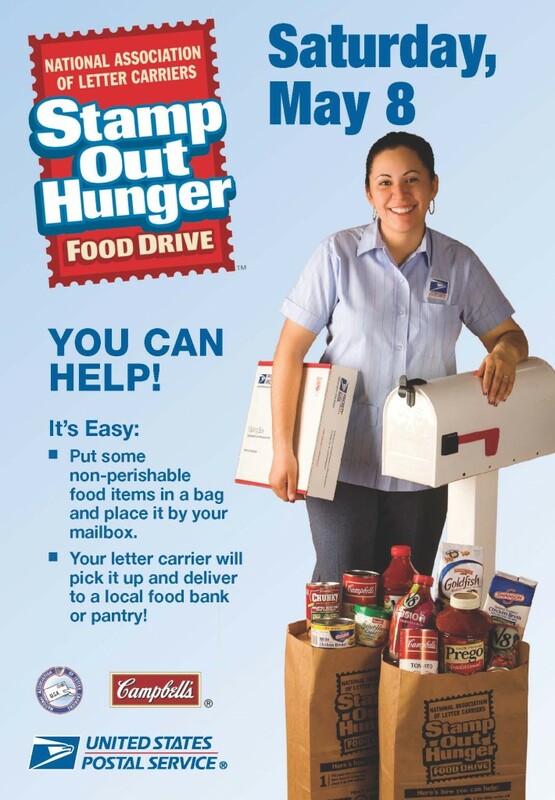 You can set out a bag of non-perishable food items by your mailbox and your Postal Carrier will collect them for you! So, we do tons of shopping and stock piling through the year and here is another opportunity to give back! I say another, because we should all be giving on a regular basis. I get tons of FREE samples and FREE magazine subscriptions in the mail and i give most of them to the night shelter or local food banks. I also regularly give of my shopping to the same places. One place here is town has a “drive thru” of sorts set up. It makes it so easy! As I shop and load the groceries in my car, I sort them and tie the bags going to the local food bank and at the end of my shopping I drive up they open the back of my van take out what’s tied and I drive off! So easy! So, we always have extra, and I know we also give to family and friends. But, I know personally I give to my kids who have moved out, some of their friends, and our own personal use for my husband the youngest and I, we still have enough toothpaste, shampoo, hand soap, chili, pork and beans, oatmeal, mustard – that we can still give more and have plenty left! So, go thru your stuff and find a way to give even more. It’s been tough for everyone for a couple of years now, but, we have an advantage, we know how to shop and have extra too. So, let’s give back! I would love to see pics of what you are giving and if you are leaving it for your postal carrier or if you are taking it to your church or local charity! Share what you’re doing! I’d love to hear! I’d also love to hear what you do with all the samples you get ion the mail. Tamona over at Tamona’s Tips said she gives “pet baskets’ to her neighbors for their pets with all her pet samples. @kathy: Thanks for sharing! Your ideas are great! I LOVE making up goodie bags too! A couple of years ago I got these large pink totes from CVS for FREE and a friend was moving and we gave her a going away party and I filled the bag with food and cleaning supplies and cool stuff, it’s so much fun! My Mom used to get a diaper pail and a clothesline and clothes pins and she would buy all kinds of Baby goodies and pin them to the clothesline and put them in the diaper pail. The new Mom would open the diaper pail and they would begin pulling the clothesline out and it would stretch all across the room! FUN! Thanks for sharing and the kinds words!